The paper “High-intensity versus low-level laser therapy in the treatment of patients with knee osteoarthritis: a randomized controlled trial” Kheshie et al 2014 pitches the 3B BTL laser against the HIRO class IV “High intensity” laser. The results appear to show that the HIRO class IV “High intensity laser” was more effective than the “Low Level Laser”. HOWEVER, the HIRO class IV “High intensity” laser was delivered over a large area (not adequately defined but approx 100cm2 by my estimation) so the intensity was actually very low (about 13mW/cm2 which is less than most LED systems), and the 3B BTL “Low Level Laser” was actually very high (4 x 200mW small, high intensity beams) and were held stationary on the patella for over half an hour, YES, HALF AN HOUR IN ONE SPOT! This is insane. This paper leads people to think that the class IV Hiro laser was more effective because it was higher intensity when in fact the beam distribution meant the average intensity distribution was low (13mW/cm2). The 3B laser was not so effective because it was held stationary such that it would cause an overdose. If the 3B laser treatment had been delivered in using same scanning technique as the class IV then they would likely have achieved the same result. (I am not a fan of scanning because you can never be sure how much energy you have delivered to an area, better to use a low intensity device and hold it still in my view). 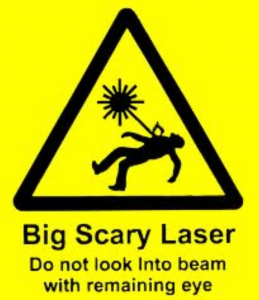 This paper misdirects the reader towards favouring class IV lasers rather than 3b or LED by misinforming the reader. High-intensity versus low-level laser therapy in the treatment of patients with knee osteoarthritis: a randomized controlled trial. Department of Anatomy, Faculty of Medicine, Umm Al-Qura University, Mecca, Saudi Arabia. The aim of this randomized controlled study was to compare the effects of low-level laser therapy (LLLT) and high-intensity laser therapy (HILT) on pain relief and functional improvement in patients with knee osteoarthritis (KOA). A total of 53 male patients participated in this study, with a mean (SD) age of 54.6 (8.49) years. Patients were randomly assigned into three groups and treated with HILT and exercise (HILT + EX), LLLT and exercise (LLLT + EX), and placebo laser plus exercise (PL + EX) in groups 1, 2, and 3, respectively. The outcomes measured were pain level measured by visual analog scale (VAS) and knee function measured by Western Ontario and McMaster Universities Osteoarthritis Index (WOMAC). Statistical analyses were performed to compare the differences between baseline and posttreatment measurements. The level of statistical significance was set as P < 0.05. The result showed that HILT and LLLT combined with exercise were effective treatment modalities in decreasing the VAS and WOMAC scores after 6 weeks of treatment. HILT combined with exercises was more effective than LLLT combined with exercises, and both treatment modalities were better than exercises alone in the treatment of patients with KOA. I suspect a Class IV laser company (HIRO?) funded this study in an effort to mislead people away from LLLT and 3B lasers because the word is getting out that everyone who has overinvested in Class IV lasers may actually be harming their patients and the Class IV laser manufacturers may start seeing their market share drop. Time for misinformation before LLLT becomes universally accepted as the only modality that should be used!